This book reveals the three most important capabilities leaders must demonstrate today: the ability to set strategy, empathize with others, and take risks—all at the same time. 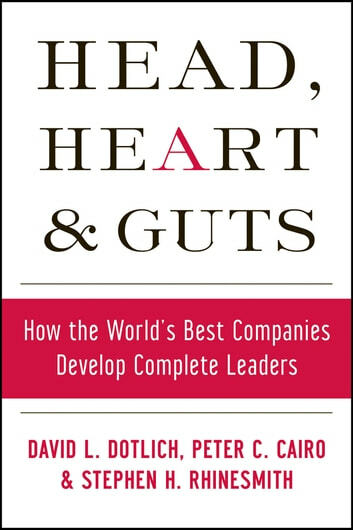 In Head, Heart, and Guts, leadership experts David Dotlich, Peter Cairo, and Stephen Rhinesmith—who teach and coach CEOs and executive teams throughout the world—argue that to be successful in a complex, matrixed, fast-moving world, “whole” leaders must set strategy, develop trusting relationships with others, and consistently do the right thing based on personal values. “Partial” leaders, often the product of traditional executive programs, may be successful in the shortrun, but their companies lose over time. 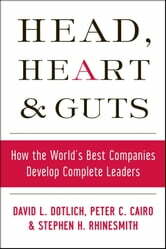 Filled with case studies of companies such as Bank of America, Johnson & Johnson, Novartis, and UBS, Head, Heart, and Guts, lays out specific steps and actions for leaders who want to grow beyond their “leadership comfort zone” and an action plan for companies that want to move beyond tried-and-true leadership development in order to develop “whole” leaders throughout their leadership pipeline.